Tired of french fries as a side? 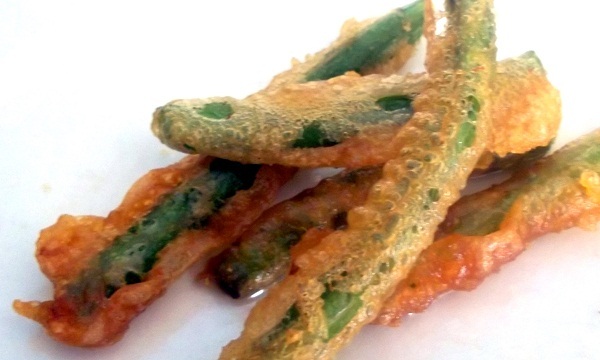 Add a light, crispy coating to green beans! Beer is always available in hostels, and since you only need a little bit for the batter buy a big bottle and drink while you cook. This same batter can be used for most vegetables, fish, and chicken. Enjoy! 1. Combine Beer, Flour, salt, and paprika into mixing bowl and stir until smooth. The batter needs to sit for about 30 minutes. The beer needs time to work its magic and break down the glutens. So I always make the batter first, then proceed with the rest of the recipe. 2. Wash green beans and cut off top and tail of the beans. 3) Once the beer batter has sat for at least 30 minutes, Heat oil in frying pan at medium-high temperature. 4) Dip green beans in beer batter, and fry in hot oil.Fry for 2-3 minutes flip, and fry for an additional 2 minutes. Green beans should be crispy and golden. Do not over crowd the frying pan, this will cause the oil temperature to drop and the green beans will be soggy and gross. Remove and place on paper towels to absorb the excess oil. Season with salt and pepper. If the hostel has a rack in the oven, wash it, take it out and place it on top of the paper towels. Then put your beer battered green beans on the rack to dry, allowing the oil to drip onto the paper towel. This will help stop the beans for soaking in the excess oil and getting soggy.